Inventory We are a resale marketplace, not a box office or venue. Ticket prices may exceed face value. This site is not owned by Forest Hills Stadium . The Forest Hills Stadium was home to the US Open Tennis Championships from 1915 to 1977 with a short break between 1920 and 1924. 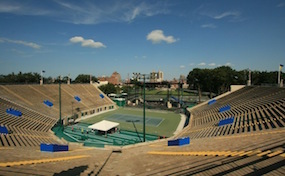 The Forest Hills Stadium box office is located at One Tennis Place in Forest Hills Queens. The venue has been host to some of the biggest names in the concert business like The Beatles, Barbra Streisand, The Who, Bob Dylan, and Jimi Hendrix. Recently it has become another popular venue in the New York area for concerts including shows by Mumford & Sons and Ed Sheeran. The West Side Tennis Club is a private facility with courts made of clay, Har-Tru, grass, and concrete. A swimming pool up to Olympic standards is another amenity provided by the club. This is a club for the elite athletes in New York. ForestHills.StadiumQueens.com is not associated with any primary website, box office, and or official supplier. We are an independently owned and operated company that concentrates solely in the online resale of all events in the secondary ticket market. Prices on our sites may fluctuate with demand. To order tickets for all Forest Hills Stadium events please follow the steps online.